WOW! Have I suddenly bought a new camera and completed a full course in food styling and photography? No, this picture was taken by the fantastic uber talented Celine and she’s letting me use it. The recipe for these potato wedges will be included in her next book (co-written with the equally wonderful Joni) The Complete Guide to Vegan Substitutions. 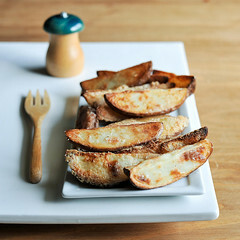 I’ve tested over 700 recipes for a large number of extremely talented authors but these wedges stick out in my mind because we’ve eaten them so many times. I love potato wedges and have made them many many times, sometimes following recipes and sometimes just trusting my instincts and bunging them in the oven. But without any hint of a shadow of doubt, these potatoes are the best. There are just a couple of little easy secrets to them that lift them from being just a normal potato wedge to something special. I test so many new recipes that something has to be very special for me to make it again. To make this as many times as I have is a record – especially before the book has even been published! I haven’t got my copy of this book yet but I can whisper in your ear that testing has already finished for their third book Hearty Vegan is going to my favourite of their three books so far! 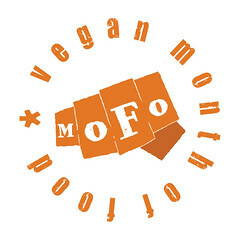 This entry was posted in Vegan Substitutions, Veganmofo 2010 and tagged Veganmofo 2010 by efcliz. Bookmark the permalink. Oh, I want them! Your description makes them sound totally incredible. Ha! I thought that was a Celine pic! I love her style. I can’t wait to get that book!